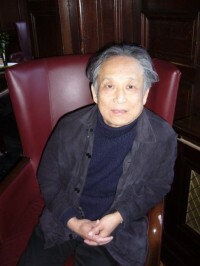 Gao Xingjian, two meetings in Paris with a complete artist. Gao Xingjian, Nobel prize winner in literature is best known for his books and especially for a masterpiece, “The Soul Mountain.” He is also known for his plays and his opera “Snow in August” and we admire his creations and his experiments with theatrical forms. He is also famous as a painter and did not fail to recall that painting for a long time earned his living. 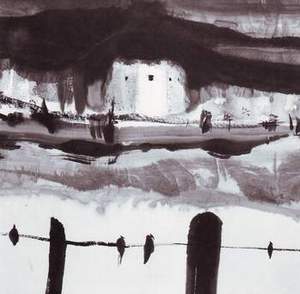 In Paris, Galerie Claude Bernard (1), he will exhibit small size inks on paper. “Painting is not an illustration,an interpretation, there is an autonomy of the image. The vision is quite a different story ..There is another way of thinking with pictures ..The closest to this is music, the music brings such images without using language”. His exhibition at the Museum Würth which I visited a few months after an article of Rue 89, was a real shock with stunning large formats. Thirty thousand people visited this exhibition, 500 people attended a debate between Gao Xingjian and his friend and translator Noël Dutrait. Instead of following this German entrepreneur, the french industrial leading companies, spend millions of dollars in “corporate” advertising campaigns without any cultural impact ! – You speak of three components in your films ? (1) Galerie Claude Bernard, Rue des Beaux Arts in Paris .January 13 to February 19 2011. (2) “La sihouette sinon l’ombre” (2006), a film started in Marseille in 2003. A seminar in Paris, the 15th of December on Mao and popular memory.